This is the 3rd in my series of post on short (and low) 40 meter vertical antennas I am exploring for my new station. Even though I might not build any of them, still opting for a full-sized delta loop, the exercise is useful in understanding what is gained or lost when attempting to squeeze a low-band antenna into a smaller space. I previously modeled and explored a linear-loaded vertical dipole and a lazy-H design. Now I am moving on to vertically-polarized shortened "full-wave" loops. Loops, like dipoles and their variants, can be shortened in a similar fashion. Since there are no "ends" to a loop the positioning of the loading elements is a little more interesting. As you will see in the two designs I look at in this post they can be structurally complex, more so than the complexity inherent in any full-wave loop antenna. As always, for me the antenna must be an acceptable DX performer, which mostly means low loss and low angle radiation. 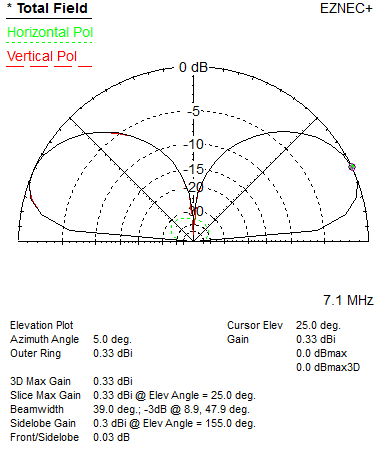 This duo of attributes is difficult to attain in a low-height, low-band antenna since horizontal polarization requires height and vertical polarization undergoes sometimes brutal attenuation at low radiation angles. 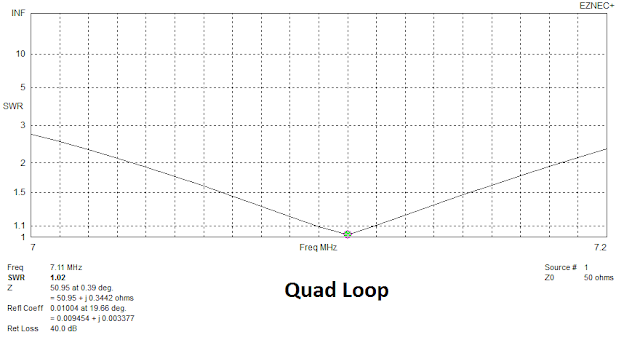 The two loop configuration under consideration are the delta loop and the square quad loop. 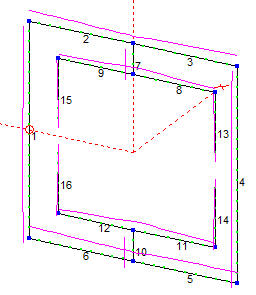 To be a primarily-vertical radiator the delta is fed λ/4 from the apex and square is fed halfway along one side. 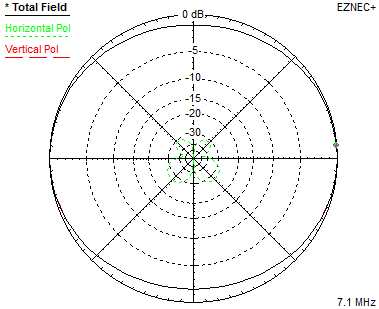 The EZNEC models show the sources (feed point) as circles and the current distribution on these shortened antennas. The feed point symmetry is retained despite the size in order to maintain the pattern. The loading elements placement ensures that the two current maxima are in approximately the same relative positions on the scaled-down loops. One unavoidable difference is that the distance between the maxima is reduced. That will affect the pattern. The model for the quad loop is based on one I found in ON4UN, John Devoldere's book "Low-Band DXing". My 1987 version is quite old so I can't say if it's in newer editions. 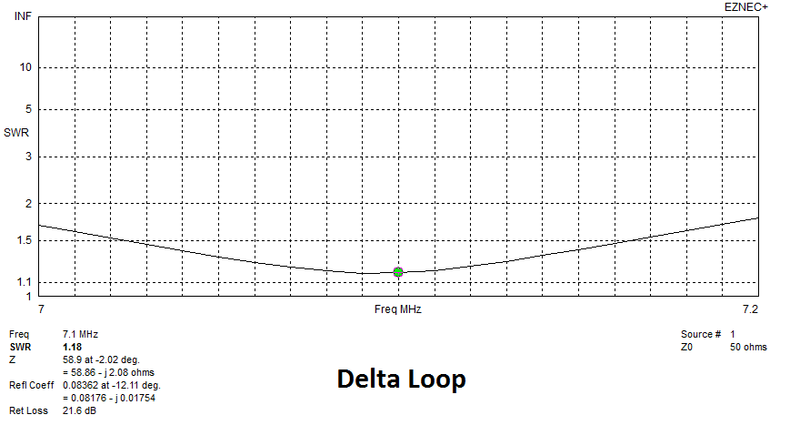 My delta loop model is similar with regard in connecting the linear loading elements 1/4-circumference either side of the feed point. As modeled, the circumferences of the quad loop and delta loop are 26.4 meters (0.63λ) and 30.16 meters (0.71λ), respectively, with about 2% of the reduction due to the wire insulation (#12 THHN). Loading of the delta loop is lessened to avoid additional construction complexity. Getting significantly shorter than these figures requires coils, which adds losses I want to avoid. Getting much shorter will also reduce the impedance, probably even below 50Ω. Both antennas are modeled at a height of 3 meters (at the bottom horizontal wire) to keep it away from prying hands for safety and security. The average current height is about half way up on both, working out to about 6.6 meters and 10.4 meters on the quad and delta, respectively. Their respective heights are 9.6 and 11.7 meters above ground. Both use insulated copper wire (#12 THHN), except that the top wire of the quad is 25 mm (1 inch) aluminum tubing. This latter specification is required to make the loop rigid, assuming the quad is centred on the mast. Thin nylon rope can be used to tension the interior loading wires so as to keep them in their specified positions. The model assumes that the support mast is non-conductive, such as a (rope) guyed fibreglass mast. A conductive mast significantly changes these antennas because it is vertical and crosses the loops, especially so because the crossing is at their high-impedance points (low current, high voltage). You can use metal but the antennas would be very different, absolutely requiring precise size and placement of the mast within the model. When tuned low in the 40 meter band (CW) the match bandwidth is still good enough to cover the entire band with either antenna, but the quad will require the services of the rig's ATU. 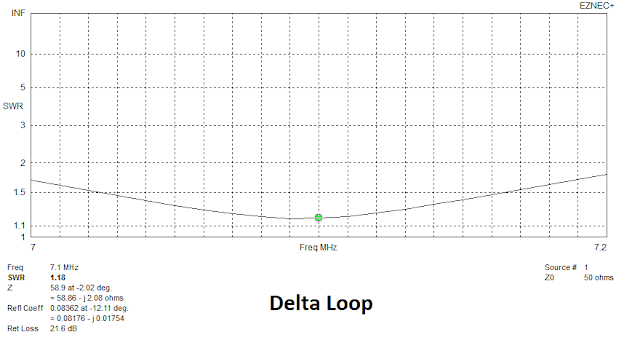 The delta loop retains a somewhat high impedance which is easy to bring closer to 50Ω with a λ/4 transformer made of 70Ω coax. This is incorporated into the model for the delta loop. 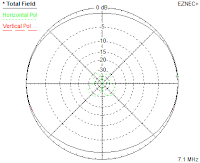 For both antennas it is desirable to run the transmission line orthogonal to the antenna plane, and mandatory to use a current (common mode) choke close to the feed point. It is counterproductive to carefully craft an antenna for the desired pattern and match and then throw it all away due to transmission line coupling and radiation. With two current maxima in these antennas the azimuth pattern cannot be as perfectly circular as for the single element verticals we've already seen. 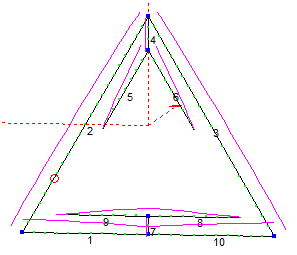 Even so the pattern is omnidirectional, with minima of less than 1 S-unit. I can live with that. Both antennas show almost the exact same azimuth and elevation patterns so I am not bothering to show both. Both antennas are lossy -- about -5.7 db -- similar to vertical polarization ground losses in the previously-modelled verticals. Poorer soil increases losses, such as that found in urban landscapes. The modelled loss changes little with height. Additional height does add some forward gain; for example, raising the quad loop from 3 to 5 meters adds 0.3 db, which is negligible. Both loops are sensitive to height above ground. Even a change of as little as 1 meter will noticably shift the resonant frequency and ground losses. A big down side with these short loops is that an ~30% reduction in circumference is not enough to justify the complexity and likely fragility. At least that is my opinion for my circumstances. Others may see it differently. My tentative conclusion on these two antennas is that if I had to choose between them I would choose the short delta loop. Considering the near identical performance, I like the simpler construction and likely lower cost. The 70Ω coax for the matching transformer is no obstacle since it's readily available and adds almost nothing to the total cost. In my next post I'll compare all of these vertical 40 meter antennas and try to come to some conclusion of whether to stick with a full-sized delta loop or opt for one of these short antennas. They will also be compared to an inverted-vee antenna that would employ a mast of similar height.